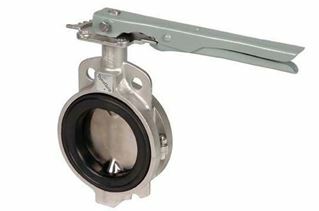 DynaQuip 700/722 Series butterfly valves are designed to provide years of rugged durability at a competitive value. Built for HVAC, utility, commercial and general industrial applications and media, these valves offer many more years of performance over lightweight throwaway valves. This valve can be automated – see our DynaFly 70F/72F series. Please select ‘Search by Specification’ to narrow product results for a specific application. 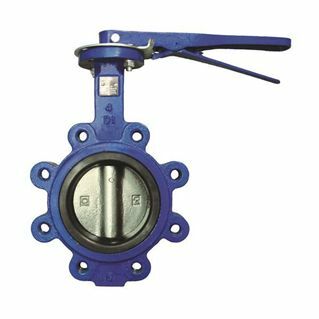 Wide flange-face sealing area provides a tight flange-to-valve seal and negates the need for flange gaskets. Once-piece 416 Stainless Steel stem shaft ensured dependability and positive disc positioning. Locating holes at bottom and top of Wafer Valve Ease Installation. Lug style valve has drilled and tapped lugs meeting ANSI 125/150 flange standards. Precision Taper Pin Ensures a positive vibration proof shaft to disc connection. Four Bushings furnish shaft support for positive shaft alignment and actuator support. Body - Lug style has drilled and tapped lugs meeting ANSI 125/150 flange standards. Wafer body has locating holes at top and bottom. Disc – Smooth finished Disc Flats align with Seat Flats to give a highly efficient seal which helps to prevent leakage into shaft areas. Precision machined and hand polished for positive seal with contoured edges for lower operating torque plus increased seat life. Comes in ductile iron, aluminum bronze, 316 stainless steel. The movement of the elastomer against the body assures a completely dry back. The controlled-torque Seat allows tight shut-off with minimum movement of the seat material to reach the closed position in the center of the seat for ease of actuation. The wide sealing area around the shaft provides a positive self isolating the shaft form the media. Top Plate Standard ISO 5211 - Accommodates all types of actuators; handles, gear operators, electric and pneumatic actuators. Square connection shaft gives positive attachment for handle or actuator. Stem - Machined from 416 stainless steel to eliminate twisting of stem. Gives direct disc control of full or partial product flow. Stem Bushing - Composed of Acetal, stem bushings absorb operator side thrust and help prevent side-load. Shaft Weather Seal - Prevents environmental intrusion of elements, helps to combat side load torque. O-Ring Seal – Provides further prevention of stem leakage. Matches seat material of EPDM or Buna-N.
Flange Seal/Seat Face - Resilient seat which provides an absolute seal to all flanges within specifications. No other gaskets required.